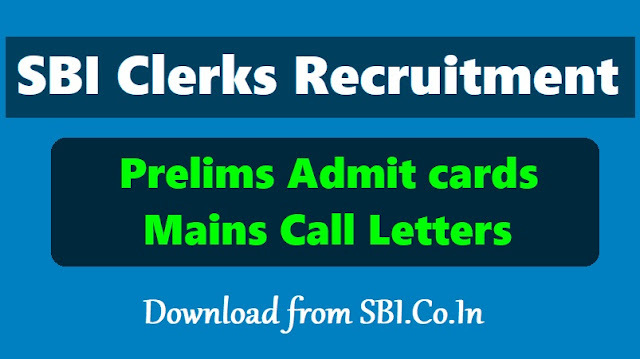 SBI clerk prelims admit card/hall ticket 2019 download: State Bank of India (SBI)'s Central Recruitment & Promotion Department has notified new dates for recruitment process of Junior Associates (Customer Support & Sales) or Clerks in Clerical Cadre in the bank. Further to the SBI clerks recruitment advertisement dated January 20, 2018, regarding recruitment of Junior Associates (Customer Support & Sales) in Clerical cadre in SBI, the bank has now informed that the Preliminary Examination scheduled to be held tentatively in the month of March/April 2018 has been deferred and it will now be held tentatively in the month June/July 2018. SBI will release admit cards Junior Associates preliminary exam, tomorrow. The prelims exam will be held on June/ July. As of now no exact date has been announced by SBI. Online registration for SBI Junior Associates post was held in January-February 2018. With more than 9000 vacancies open for recruitment, this is one of the biggest recruitment of the year conducted in the banking sector. Candidates can download the SBI Junior Associates admit card at the official website sbi.co.in/careers by using using registration number/ roll number and date of birth/ password. 'Adequate number of candidates in each category as decided by the Bank (approximately 10 times the numbers of vacancies, subject to availability) will be shortlisted for the main exam from the list of all candidates arranged in descending order of aggregate marks scored. No minimum qualifying marks for individual subject as well as for aggregate (overall) are prescribed,' reads the official notification released by the Bank regarding the selection process. SBI Junior Associates prelims exam will comprise of three sections carrying a total of 100 marks; the exam duration will be 1 hour. Questions will be asked from English language, numerical ability and reasoning ability subjects. The bank has also changed the dates for download of call letter for preliminary examination from the existing March 1 to June 6, 2018. The SBI Clerks Main examination will be held on August 5, 2018 for which the call letters will be released on July 23, 2018. All the new dates are tentative, according to a statement from General Manager, Central Recruitment & Promotion Department, SBI. To fill the regular and backlog vacancies, SBI had announced a total of 9366 vacancies. Online registration of application and payment of fees of SBI clerk recruitment was concluded by February 10, 2018. SBI Clerk Preliminary Examination (online) consist of Objective Tests for 100 marks and will be conducted online. This test would be of 1 hour duration consisting of 3 Sections. The paper of SBI Clerk main examination (online objective type) would have questions from areas like General Financial Awareness, General English, Quantitative Aptitude and Reasoning Ability& Computer Aptitude. Each test will have separate timings. The admit card for SBI clerk prelims examination (Junior Associates (customer support and sales) is expected to be release on June6. The online preliminary examination is scheduled to be held in June/July 2018. The SBI bank will also release a ‘Acquaint yourself booklet’ which will provide detailed information about the exam. It contains information pertaining to various aspects of the online exam and describes the kind of test that will be given in the examination. Candidates should study the booklet carefully as it will help them prepare for the exam. Step 2: Click on the link for Career’s section. Step 3: Click on the link for SBI Clerk prelims admit card in the latest announcements to go to the login page. Step 4: Key in your registration number/roll number, password/date of birth, captcha code (as in the image). Step 5: Click on login and your admit card will be displayed on the screen. Step 6: Take a printout and save it on your computer. No hard copy of the call letter will be sent by post. Candidates will have to take an online preliminary exam and the main exam followed by the local language test. The preliminary exam will be of one-hour duration, carrying 100 marks and divided into three sections: English language (30 marks), numerical ability (35 marks) and reasoning ability (35 marks). Candidates will get 20 minutes for each section. The preliminary exam is of qualifying nature. The number of candidates selected for the main exam will be approximately 10 times the number of vacancy in that category. The two-hour main exam will carry 200 marks and will be divided into four sections: General and financial awareness (50 marks) General English (40 marks), quantitative aptitude (50 marks) and reasoning ability and computer aptitude (60 marks). Candidates will get 35 minutes each for general and financial awareness and general English and 45 minutes each for quantitative aptitude and reasoning ability section. Marks obtained in the main exam will only be considered for making the provisional selection list.Candidates, who produce the necessary certificate proving they studied the specified local language, will not have to undergo the language test otherwise compulsory for others. Note: Candidates are advised to regularly keep in touch with the SBI website www.sbi.co.in/careers for details and latest updates. More details of this recruitment can be found at sbi.co.in/careers.